Document compiled by the donor Jean Keighren, about the WW1 service of her great uncles, Donald (Danny) and Thomas MacCulloch. Danny MacCulloch served in the 1/6 Seathforth Highlanders from the 28th July 1916 to 9th of March 1919. He was promoted Corporal 21st March 1918 and was awarded the Military Medal for gallantry in the field in March 1918 with a Bar to the Military Medal awarded in April 1918, two distinct acts of gallantry in the space of three weeks! In July 1918 he travelled to Le Touquet for a Lewis Gun course and he was demobilised on 9th March 1919. His brother Thomas serving in the 1/5 Seaforth Highlanders was killed in action at Beaumont Hamel, France aged 23 13th-14th November 1916. 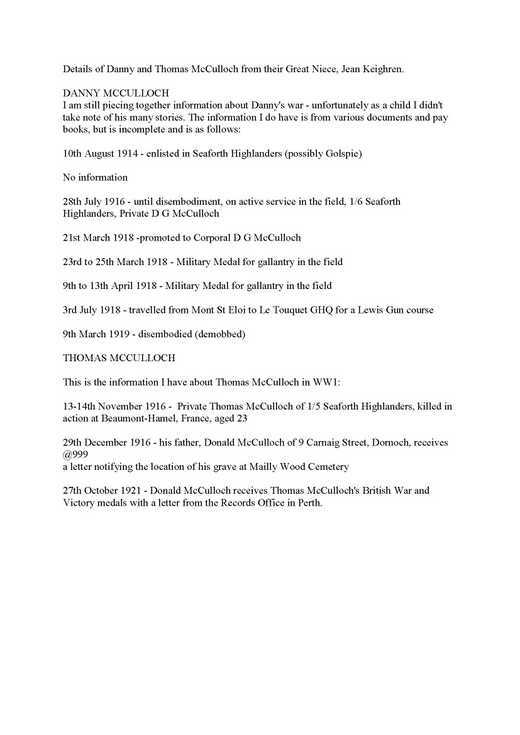 On 29th December 1916 his father Donald MacCulloch of 9 Carnaig Street, Dornoch received a letter notifying the location of his grave at Mailly Wood Cemetery and subsequently received on 27th October 1921 Thomas' Victory and War medals.